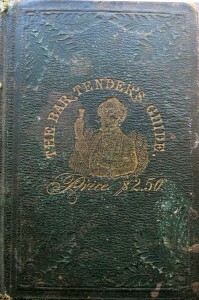 The first drinks book in the English language to contain recipes for cocktails, The Bar-Tender’s Guide or How to Mix Drinks by Jerry “The Professor” Thomas (later retitled How to Mix Drinks or the Bon-Vivan’ts Companion) presented the broad variety of mixed drinks that had gained rapid popularity in the United States by the early 1860s. Ten cocktails appear in this landmark work: Brandy, Champagne, Fancy Brandy, Fancy Gin, Gin, Japanese, Jersey, Soda, The, and Whiskey. 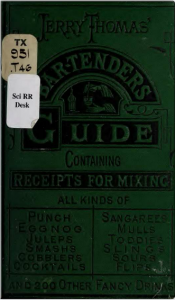 Thomas’s travels to England in 1859 where he appeared as a guest barman at the Bowling Alley Bar in London’s Cremorne Pleasure Gardens yielded a few adaptations of British drinks such as Gin Punch by [Alexis Benoit] Soyer. Bottled cocktails and punch to speed up service are also introduced in this amazing mixed drink bible. Click here to read the 1887 edition. Amazing book. How i get this book? There are a number of reproduction copies available on Amazon, if you want to purchase a physical copy. An actual original volume will cost you upwards of £600-£1000 from a book collector or antiquarian book dealer. And they are very scarce at this point.